310 Beacon is located on the north side of Beacon, between Exeter and Fairfield, with 306 Beacon to the east and 312 Beacon to the west. 310 Beacon was designed by Peabody and Stearns, architects, and built in 1903-1904 by McNeil Brothers, builders, as the home of sugar manufacturer Joshua Bailey Richmond and his wife, Josefa (Rubira) Richmond. He is shown as the owner on the original building permit application, dated June 13, 1903. They previously had lived in the house formerly at 310 Beacon and, after acquiring 308 Beacon in June of 1903, they razed both houses and replaced them with a new residence built on both lots. They also maintained a home in Little Compton, Rhode Island. Click here for an index to the deeds for 310 Beacon and its predecessor houses. Plans for 310 Beacon – including elevations, foundation and piling plans, floor plans, and framing plans – are included in both the City of Boston Blueprints Collection (reference BIN A-89) and in the Peabody and Stearns Collection (reference PS/MA.133) in the Boston Public Library’s Arts Department. Click here to view elevations and floor plans for the original building. 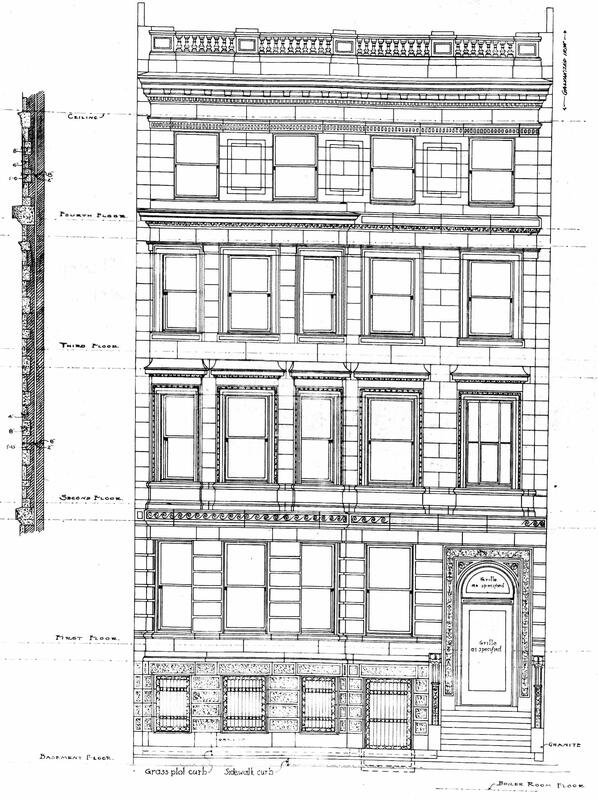 Architectural rendering of front elevation of 310 Beacon (1903) by Peabody and Stearns, architects, courtesy of the Boston Public Library. Josefa Richmond died in June of 1931 and Joshua Richmond died in August of 1931. The house was not listed in the 1932 and 1933 Blue Books and was shown as vacant in the 1932-1933 City Directories. On August 15, 1933, 310 Beacon was acquired from Joshua Richmond’s estate by Mary Anna (Sullivan) Flanagan, the widow of stockbroker Joseph Francis Flanagan. She previously had lived in Brookline. In September of 1933, she applied for (and subsequently received) permission to convert the stable at the rear of the property into a garage. Mary Flanagan continued to live at 310 Beacon until about 1944. Her son, Austin Gerard Flanagan, lived with her. On October 23, 1944, 310 Beacon was acquired by Fred L. Arata and his mother, Julia (Giulia) (Leverone) Arata, the widow of Paul (Paolo) Arata. Fred Arata was a retail liquor dealer and real estate investor. He and his wife, Annette Flossie (Crovo) Boggiano Arata, lived in Brighton. Julia Arata lived with them. In November of 1944, Fred Arata applied for (and subsequently received) permission to convert the property from a single-family dwelling into nine apartments. Julia Arata died in April of 1952, and on April 5, 1954, Fred Arata transferred the property into his and his wife’s names. On October 10, 1959, 310 Beacon was acquired from Fred and Annette Arata by Jabran K. Kurker of Medford, George K. Kurker of Arlington, and Charles Wayshak of Boston. On June 28, 1962, 310 Beacon was acquired from them by Barnett Nathan Samuels and his wife, Bessie Samuels. On April 22, 1971, they transferred 310 Beacon to Barnett N. Samuels, Burton Samuels, and Martin A. Samuels, as trustees. On December 15, 1975, 310 Beacon was acquired from the Samuels trust by Robert A. Keating, trustee of the 310 Beacon Street Realty Trust. The sole beneficiary of the trust was Thomas Francis Twomey. In March of 1994, Thomas Twomey applied for (and subsequently received) permission to construct a penthouse of approximately 36 feet by 38 feet, designed by Ahearn-Schopfer, architects. From subsequent letters from the Back Bay Architectural Commission, it appears that this penthouse was either not approved by the commission or was built in a manner different than that approved by the Commission. Thomas Twomey died in February of 2003, and on November 19, 2004, Carol Fulton, successor trustee of the 310 Beacon Street Realty Trust, transferred the property to the Mellon Trust of New England, trustee of the Thomas Francis Twomey Revocable Trust. On March 15, 2006, 310 Beacon was acquired from the Thomas Francis Twomey Revocable Trust by Overland Beacon LLC (James M. Godec, manager of record). That same day, the property was acquired from Overland Beacon by the 310 Beacon Street LLC (William Walser, manager of record). 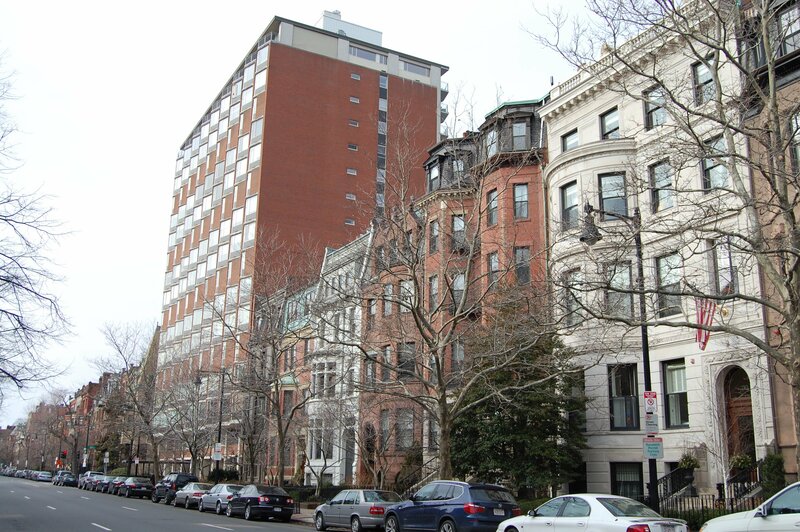 In September of 2006, 310 Beacon Street LLC applied for (and subsequently received) permission to remodel the property and reduce the number of units from nine to four. It also received permission to expand the garage at the rear to extend across the entire width of the property. As part of the remodeling, the owner agreed to remove and replace the existing penthouse. The Back Bay Architectural Commission’s Certificate of Appropriateness notes that the applicant will remove the “non-conforming penthouse addition constructed by a previous owner and cited in violation by the commission and the Inspectional Services Department” and replace it with a penthouse “to be lower in height, smaller in footprint, rotated against the higher party wall of the adjoining building to the east, and appropriate in design and materials…”. 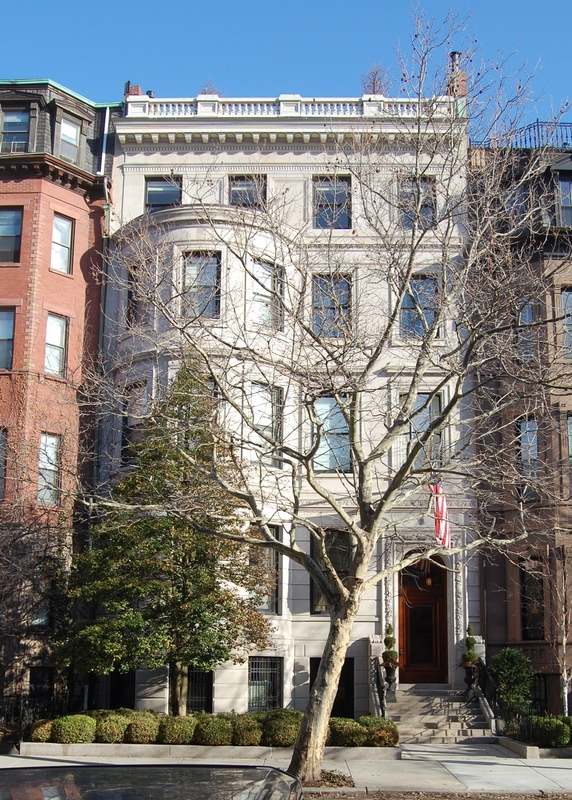 On January 3, 2008, 310 Beacon Street, LLC, converted the property into four condominium units, the 310 Beacon Street Condominium. 308-310 Beacon were built ca. 1871 by Daniel Davies and his son, Charles H. Davies, housewrights and master carpenters, a symmetrical pair of houses (308-310 Beacon). At the same time, Daniel and Charles Davies built a second pair of houses at 312-314 Beacon. In his Houses of Boston’s Back Bay, Bainbridge Bunting attributes 308-310 Beacon to architect Charles K. Kirby, but does not attribute 312-314 Beacon to him. Bunting’s source for attributing 308-310 to Charles Kirby is not known. Charles Kirby designed and built 304-306 Beacon at about the same time as 308-310 Beacon were built, and Bunting may have concluded that he designed them as well (308-310 Beacon had been demolished by the time Bunting wrote his book). This attribution is uncertain, inasmuch as both 308-310 Beacon and 312-314 Beacon had brownstone facades, whereas 304-306 Beacon have brick facades. However, if 308-310 Beacon were designed by Charles Kirby, then it is likely that the companion buildings at 312-314 Beacon were as well. The houses at 308-310 Beacon and 312-314 Beacon were built while the land was still owned by the Boston and Roxbury Mill Corporation, probably under an agreement with Daniel and Charles Davies. On November 23, 1871, Daniel and Charles Davies acquired the land for all four houses, the deeds confirming that they had erected houses on the property in conformance with the building restrictions set forth in the deeds. A December 19, 1871, advertisement by Daniel Davies and Son in the Boston Transcript, offering 308 Beacon for sale, described the house as “four stories, exclusive of basement and attic.” 310 Beacon and 312-314 Beacon probably were offered for sale at about the same time. However, they were not sold until the mid-1870s. 308 Beacon was purchased from Daniel and Charles Davies on February 1, 1875, by rubber merchant and manufacturer David Hunt. He and his wife, Antoinette (White) Hunt, made it their home. They previously had lived in the Longwood district of Brookline. The Hunts’ unmarried children — Abby W. Hunt, William David Hunt (treasurer of the Suffolk Company, harness manufacturers), and Belle Marinda Hunt — lived with them. William Hunt married in May of 1894 to Frances Emily Hitchcock; after their marriage, they lived at 264 Commonwealth with her mother, Sarah Frances (Crosby) Hitchcock, the widow of John Hitchcock. 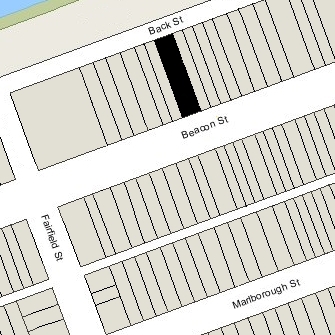 The Hunts were living elsewhere in June of 1900 (at the time of the US Census) and 308 Beacon was the home of boot and shoe dealer Arthur E. Mann and his wife, Eleanor M. (Fairbrother) Mann. By the 1900-1901 winter season, they had moved to 435 Beacon. David Hunt died in February of 1901. Antoinette Hunt moved to 17 Gloucester to live with their son-in-law and daughter, Robert Dawson Evans and Maria Antoinette (Hunt) Evans. Abby and Belle Hunt moved with her. During the 1901-1902 winter season, 308 Beacon was the home of Miss Georgiana Gordon King. She had lived at 377 Beacon during the 1899-1900 season. She also maintained a home in Newport. On June 12, 1903, 308 Beacon was purchased from David Hunt’s heirs by Joshua Bailey Richmond, who lived at 310 Beacon. He razed both 308 Beacon and 310 Beacon soon thereafter and built a new home at 310 Beacon. 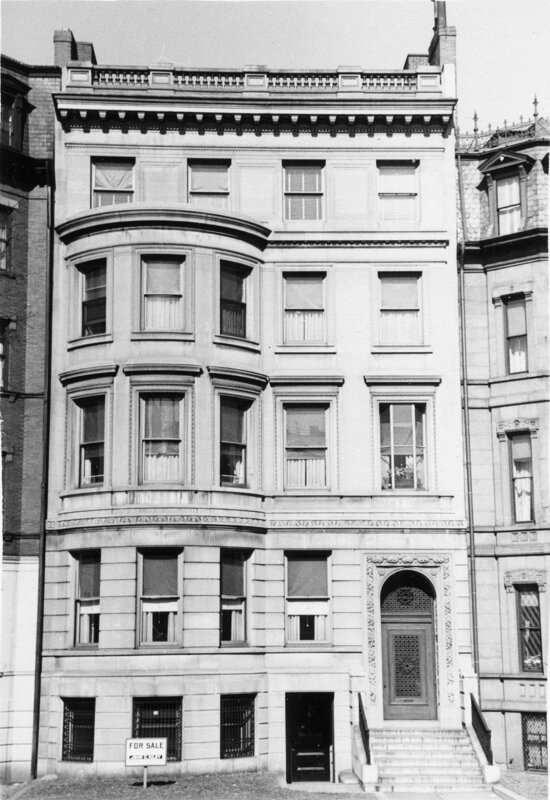 310 Beacon was purchased from Daniel and Charles Davies on July 9, 1874, by Abby (“Nina”) (Perkins) Shaw, the wife of Frank Shaw. They previously had lived at the Hotel Hamilton at 260 Clarendon. Frank Shaw was a partner in the Boston office of Warren & Co., shipping merchants and operators of steamships between Liverpool and Boston. They continued to live at 310 Beacon in 1882. On April 28, 1882, 310 Beacon was acquired from Abby Shaw by Richard Montgomery Field. He and his wife, Louisa B. (Fenno) Hastings Field, made it their home. Richard M. Field was manager of the Boston Museum on Tremont Street. It was primarily a theatre, but also featured a wax museum, natural history museum, and fine arts gallery. Louisa Field died in June of 1885 and by 1886 Richard Field was living at the Tremont House hotel. On June 29, 1885, 310 Beacon was acquired from Richard Field by sugar manufacturer Joshua Bailey Richmond. He and his wife, Josefa (Rubira) Richmond, made it their home. They previously had lived at 325 Beacon. In June of 1903, Joshua Richmond acquired 308 Beacon. He razed both 308 Beacon and 310 Beacon soon thereafter and built a new home at 310 Beacon.